Posted on January 31, 2019 at 10:13 am. "Blighxploitation" instillation on the first floor at City Hall. Art is a powerful tool for communicating complex ideas. When utilized effectively, art doesn’t just help us better understand the world, it also enables us to make real change. Such has been the case with Cleo Davis and Kayin Talton-Davis, two artists in residence with the Portland Archives & Records Center (PARC). Long frustrated by shallow discussions on gentrification in an overtly anti-Black climate, the husband and wife team were selected by RACC last year to work with PARC staff to illuminate public records and examine historical documents that reveal how seemingly subtle things like forfeiture laws and nuisance ordinances were weaponized against Portland’s Black community. Their research ultimately led to their name for the exhibit and their term for the Black experience in Portland: Blightxploitation. The artists say their goal is to elevate the discussion around gentrification and to empower others—especially those affected by mass displacement in Portland’s Black community—to fight back using the same zoning codes and institutional tools that were utilized to fracture the community. Cleo Davis and Kayin Talton-Davis took note of the opportunity, and have had experience with City Archives before. 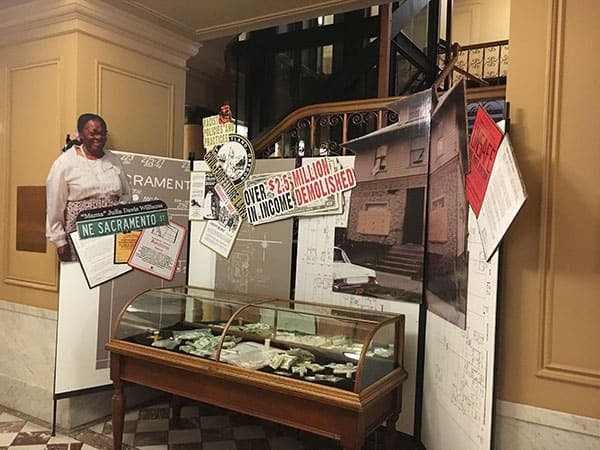 In 2014, they were working on another RACC-sponsored public art installation, the Black Williams Project, a celebration of the rich cultural heritage and history of the Black families who used to live on Williams Avenue in Northeast Portland. While very much satisfied with the outcome of the project, the artists felt like there was more to talk about. Specifically they wanted to highlight the largely covert efforts taken to end what they saw as Portland’s Black Renaissance. This desire brought Davis to the City Archives, where he hoped to find photos of his grandmother’s home. The City of Portland had targeted the home with seizure attempts for years during the 1980s and early 90s — ultimately failing in their attempts to condemn the Davis home as a crime property. Among other things, this took a considerably negative toll on Davis’s grandmother’s health. But when Cleo visited the city archives back then, he found a “sterile” environment with glass doors and a security desk requiring photo ID—he was immediately skeptical. Things only got worse when he asked for information on discrimination and archivists told him he needed to be much more specific by utilizing local government terminology. Likening the environment to Fort Knox, Davis admits the whole experience rubbed him the wrong way and he had no intention of ever going back. 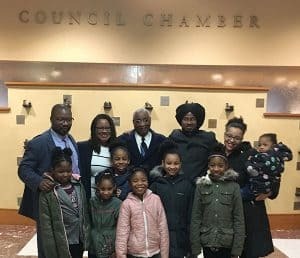 Davis family at City Hall. Once they were selected as the PARC artists in residence, Cleo and Kayin started working closely with Hansen and other PARC staff. They quickly learned how to translate terms they were familiar with—such as “red tagging” and “zebra tagging”—into the official language of city records like “urban renewal” and “civil forfeiture,” which ultimately helped them find the public documents they were looking for. One thing that stood out for the artists was the city’s decades-long campaign against supposed “blight.” From the 1940s through the 1990s, the City seized numerous Black-owned homes and/or targeted them with fines and intimidation, forcing many families to move, all under the guise of “urban renewal.” According to an official document from the Portland Bureau of Buildings from 1962, blight included roof leaks, loose steps, doors that “stick,” uncovered trash, and even seemingly ambiguous charges such as “needs paint” and “needs clean up.” Some homes were even targeted for having items like clawfoot tubs, which are now considered antiques. Hansen notes that Davis’s display has drawn some particularly emotional reactions from some passersby. Some people get viscerally upset by it and head straight to the elevator, she says. Beyond sparking people’s emotions, Hansen hopes artist residencies like these increase civic engagement. In fact, Davis’s initial inquiries about his grandmother’s home gave her the opportunity to put that idea into practice. Specifically, Hansen’s curiosity led her to a Sanborn Insurance map from the early 1900s that detailed the zoning information of Davis’s grandmother’s home and surrounding properties. What she found was that the entire area was designated as a residential zone, even though the property next to the house has long been utilized for commercial purposes. Following this revelation, Cleo Davis and his wife successfully petitioned the City to change the zoning on his grandmother’s old home so it could also be used as a commercial property. “If it wasn’t for this project, I wouldn’t have had the skills to argue for the housing zoning change,” he says. In the process, he noticed an abandoned house next door and decided this would be an opportunity to repurpose it as well. He now hopes to transform the historic Mayo House into a project called the “Art-Chive,” which will support and house creative works detailing the Black experience in Portland from the perspective of longtime residents, people simply passing through the city, and everyone in between. On January 16, Portland City Council waived the fees associated with moving the Mayo House to the Davis’ property and approved the rezoning that the artists advocated for. On the foggy morning of January 27, the house was moved. The Artist in Residence series at PARC is funded through the City ofPortland’s Percent for Art allocation that was set aside when the PARC moved to its new home on the PSU campus at 1800 SW 6th Avenue, suite 550. PARC’s Research Room is open Mondays, Tuesdays and Fridays from 9:00 AM – 1:00 PM, and Wednesdays and Thursdays from 12:00 PM to 4:00 PM. BRUCE POINSETTE is a versatile freelance writer, copy/content editor, editorialist, and speaker. Poinsette versatile work ranges from content creation to speechwriting. 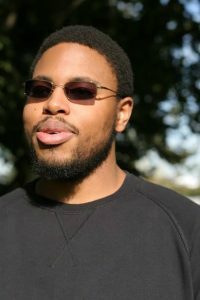 He has authored over 100 articles in five Portland area publications, including The Skanner, The Oregonian, Street Roots, Flossin’ Media, and We Out Here Magazine; in the collegiate curricula at Portland State University and University of Oregon. As a speaker, Poinsette has made presentations and participated in panels at various churches, K-12 schools, and universities. Poinsette has also conducted workshops on the journalistic interview. Find out more about Bruce and his work here.